Are you shopping for a smaller carpet extractor? 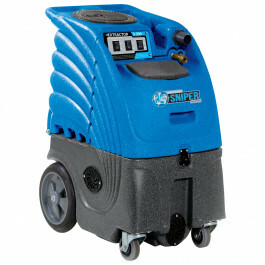 Weighing in at only 116 pounds, this little Sandia Sniper compact 6 gallon extractor is tough and can hold up under the toughest carpet cleaning jobs. Sandia makes this extractor easy to tote around to multiple locations due to the large rear wheels and lightweight body. The dual 3-stage vacuum on this extractor is great for extracting the solution out of your carpet while the light duty 200 psi pump is powerful enough to clean most carpets with ease. Add in the optional 15 foot vacuum-solution hose and a stainless steel single jet carpet wand and you have yourself a mighty little machine. *Please Note: This extremely powerful carpet extractor requires 2 separate power cords that need to be run on 2 separate 15 amp circuits. An on-board indicator lets you know when you've plugged the 2 cords into 2 separate circuits. If 6 gallons isn't enough for you and want to view a slightly larger carpet extractor, you will want to check out the Trusted Clean 'Deluxe' Non-Heated Carpet Extractor with a 12 gallon solution tank. Check out our whole listing of box carpet extractors to find just the right machine for you. 6-gallon recovery & solution roto-molded polyethylene tanks for heavy duty applications & a long work life. 200 PSI pump for powerful solution pressure delivery on those heavily soiled carpets. Powerful dual 3-stage vacuum motors for max solution removal. On-board indicator lets you know when you've plugged into 2 separate circuits. Includes semi-pneumatic non-marking wheels for easy transport. Built-in induction motor cooling system for longer motor life. Customers who were interested in the Sandia Sniper 6 Gallon Compact Carpet Extractor - 200 PSI were also interested in the following items. This is a review for the Sandia Sniper 6 Gallon Compact Carpet Extractor - 200 PSI.